WHOEVER LOOSES HIS LIFE FOR MY SAKE AND THAT OF THE GOSPEL WILL SAVE IT. One theme found in our readings for this Sunday is the suffering servant, vindicated by God. It is not the picture the disciples had for the messiah. They expected a victorious, triumphant leader. No no, said Jesus. The messiah is to be much like the suffering servant of Isaiah found in today's first reading. In our first reading (Isaiah 50:5-9), we listen as Isaiah prophesied the role of the suffering servant that would ultimately be fulfilled in Jesus Christ. He meekly and willing submited to his suffering, yet with full faith that God would deliver him. The Lord GOD opens my ear that I may hear; and I have not rebelled, have not turned back. I gave my back to those who beat me, my cheeks to those who plucked my beard; my face I did not shield from buffets and spitting. The Lord GOD is my help, therefore I am not disgraced; I have set my face like flint, knowing that I shall not be put to shame. He is near who upholds my right; if anyone wishes to oppose me, let us appear together. Who disputes my right? Let that man confront me. See, the Lord GOD is my help; who will prove me wrong? In our Gospel reading (Mark 8:27-35), we hear a two-part exchange between Jesus and his disciples. First, Peter, speaking for the disciples, proclaimed, "You are the Christ." But then completely misunderstood the role of the Christ. Peter rebuked Jesus when he predicted his passion and death. Jesus responded by teaching them the paradox of discipleship - embrace your cross. Jesus and his disciples set out for the villages of Caesarea Philippi. Along the way he asked his disciples, "Who do people say that I am?" They said in reply, "John the Baptist, others Elijah, still others one of the prophets." And he asked them, "But who do you say that I am?" Peter said to him in reply, "You are the Christ." Then he warned them not to tell anyone about him. In our Epistle reading (James 2:14-18), St. James brings clarity to the age-old discussion of whether we are justified by faith alone or by faith and good works. James' argument is that true faith must be expressed through good works. Without works, faith is dead. Good deeds is the evidence that faith exists. What good is it, my brothers and sisters, if someone says he has faith but does not have works? Can that faith save him? If a brother or sister has nothing to wear and has no food for the day, and one of you says to them, "Go in peace, keep warm, and eat well, " but you do not give them the necessities of the body, what good is it? So also faith of itself, if it does not have works, is dead. Indeed someone might say, "You have faith and I have works." Demonstrate your faith to me without works, and I will demonstrate my faith to you from my works. Our world today is suffering; our Church today is suffering; we and our families today are suffering. One thing we might learn today is that by embracing our cross, in union with Jesus' passion and death, we find meaning and purpose in our suffering. May we embrace the concept of redemptive suffering, wherein we find redemption in our suffering. 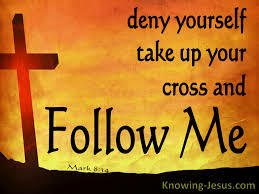 May we take up our cross and follow him.